It’s the busiest week of the year at Disney World and hungry guests now have a new spot to grab a bite! Pizza Ponte opened this weekend in Disney Springs. Our friends at the Disney Food Blog were there on opening day – Saturday – and have some great photos in their ‘first look’ post! Pizza Ponte is part of the new group of restaurants opening soon that include The Edison, Maria & Enzo’s Ristorante, and Enzo’s Hideaway. 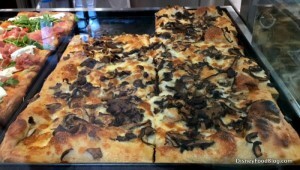 Guests dining at Pizza Ponte can enjoy pizza by the slice (square and Roman-style), sandwiches, and desserts and pastries. Beginning in 2018 the restaurant will open at 8 a.m. and will serve pastries and coffee too. Right now, Pizza Ponte is not accepting the Disney Dining Plan but we anticipate that it will be accepted at a later date. Stop by the Disney Food Blog for a full first look at the new Pizza Ponte!